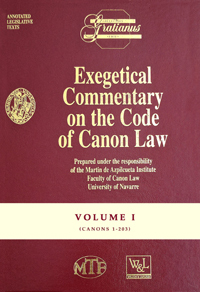 Encompassing contributions from world-renowned canonical scholars, this is considered a definitive commentary on the Code of Canon Law. This eight-book, five-volume set represents Professor Lombardia’s effort to provide a commentary on the Code of Canon Law and includes contributions from 115 of the world’s most respected canonists. Includes the Latin and English canons, research sources, and cross-references.